Although it may not feel like it, spring is at our door. This is our favourite time of year and after a long cold winter things begin to grown again. Grass is no exception. 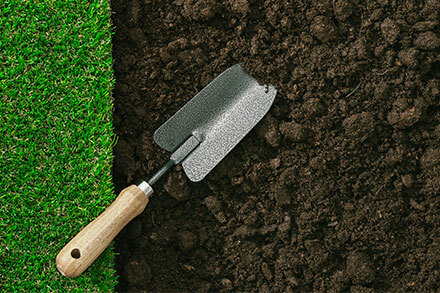 If you’re planning to sow grass seed over the coming months it’s key that the ground is properly prepared for the seed. This pre-sow preparation can be the difference between a good lawn and a brilliant, healthy lawn. This is what you need to know to get going with the sowing! Here’s how to do it right and remember – the work at the beginning is always worth it. First things first, your seed bed needs to be around 200mm in depth. The best way to achieve this is to dig over the soil with a spade or rotavator. The next step is to remove as many stones as you can. It’s key that at the very least you get rid of the bigger stones. It’s a chore but it really makes a difference. Remove weeds. If these aren’t removed at the root they will keep coming back. Just keep visualising that lovely lawn as you dig those weeds out. Let the soil settle for a minimum of one week. Two is ideal. Remove any new weeds that have sprouted over the cultivation time or any you may have missed the first time round. Now it’s time to do what we call the penguin walk. This involves shuffling across the ground in small steps. This will help firm everything up. Next, use a rake and go over the soil lightly in different directions. The final step in getting the seed bed ready is to apply a fertiliser like our Quick Release Pre Seed. Use a spreader to distribute evenly and rake in. There you have it. The 8 point plan guaranteed to give your grass seed the best possible start. If you’d like to read more check out How to Sow Seed in our Help and Advice section.